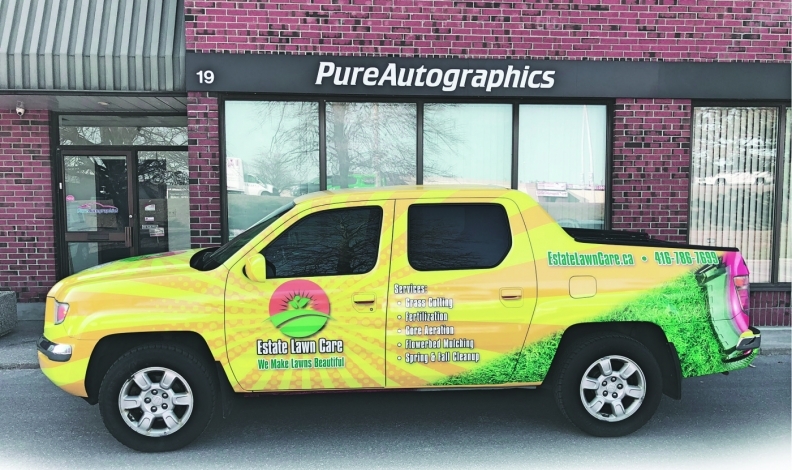 Pure Autographics says a vehicle wrap, like the one above, can be done by an individual customer or through the dealership as part of a larger customization package built into the purchase loan. The question of whether a dealership should outsource a service or perform it in-house is always financially motivated. The right answer, though, can vary widely from one dealership to another based on factors such as how specialized a skill set is required, what volume of work is available and even a storefront’s physical location. For instance, location is a barrier for Cliff Lafreniere, dealer principal at Pinewood Park Motors Ford in Kirkland Lake, Ont., and vice-president of the Trillium Automobile Dealers Association. LaFreniere said that it would be beneficial for him to keep a dent-repair specialist on staff, but the relatively remote northern Ontario location of his dealership makes finding someone too much of a challenge. “Our nearest person that we can actually hire to do this is two-and-a half to three hours away,” he said. Lafreniere said that the lost time of having inventory off his lot for repairs has a notable impact on his bottom line. The flip side to that argument is that training people can carry more costs than education, especially in larger urban centres where staff have numerous employment options. Other services, such as wraps or upfitting for trades, are too specialized for dealerships to perform. Perry Iannuzzi, president of Pure Autographics, an automotive-wrapping company in Markham, Ont., said numerous payment structures for dealerships can make outsourcing profitable. Jason Hewitt, client manager for Woodfield Canada, an industrial vehicle up-fitter with two locations in southern Ontario, said 35 to 40 per cent of the company’s business comes from dealerships. Dealers have an advantage, in that wraps and upfitting can be added to a customer’s financing to avoid having to pay upfront. Specialized service vendors offer a variety of skills. Iannuzzi’s company has been in business for about 10 years and began working directly with Toronto-area dealers roughly three-and-a-half years ago to help buyers seeking higher customization of their vehicles. Some individual buyers want color changes or custom striping, but business users are a staple. IS GOING OFF-SITE A HASSLE? 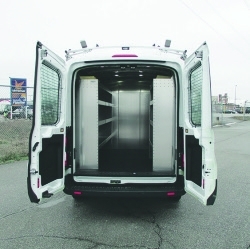 Woodfield Canada upfits commercial vans with either stock equipment or custom products, Client Manager Jason Hewitt says. Iannuzzi said that one of his greatest barriers to acquiring new dealership clients — which make up about 10 per cent of his business, a figure he would like to increase — is that sending a vehicle off-site for work tends to be perceived as a hassle. Bruce Lyons, president of Master Automotive, St. Albert, Alta., sells franchises for numerous third-party repair services, such as Crackmaster window repair, Chipmaster minor paint repair, Scorpion truck bed liners, and DetailMasters automotive detailing. Having operated for 24 years, formerly as Craftmasters, the various sub-brands do varying amounts of business directly with dealers. Chipmaster, for example, does 95 per cent of its business with dealerships, almost all of it performing minor chip and scratch repairs with fleets or to used cars. Since 1992, Dent Doctor Canada has been providing paint-less dent repair to its clients, 95 per cent of which are dealerships.